Whether you’re moving down the road, across the country or around the world, when you work with D&D Storage and Moving you’re guaranteed to work with customer-focused, full service moving professionals who have the experience, equipment and commitment you deserve. Pick up and delivery at the time you choose. No extra charge for weekend moves in Cincinnati, Ohio. Whole or partial house packing. Crating of fine art, marble, oil paintings, sculpture and statues. Piano, armoire, hot tub and other large item moving. Short and Long term climate controlled furniture storage. D&D Storage and Moving has taken the stress out of moving for thousands of families in the Tri-State area for over 40 years. Whether the move is local, state to state or even an international relocation, D&D Moving and Storage is the right choice for you. We are a family owned and operated moving and storage company based in Cincinnati, Ohio who serve Cincinnati, Ohio and the Cincinnati Area. Our main focus is on customer service: we are dedicated to exceptional customer service and we are always developing new ways to make your customer experience the best it can be. Our team meets weekly to develop new ways to deliver the highest standard in customer service and develop new strategies and techniques to make moving easier for families and individuals. We are proud of our A+ rating with the Better Business Bureau and we work hard to maintain it. 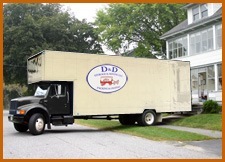 The professionals at D&D Moving and Storage are experts at providing realistic and accurate estimates and pricing. One of our consultants will meet you at your home, discuss the details of the move and give you and accurate price estimate as well as a detailed plan for handling your move. D&D Moving and Storage has the expertise and equipment to move special items, such as pianos, hot tubs, armoires and other large items. We also have the ability to crate your fine artwork, marble, sculptures and statues, taking the worry out of moving your most precious belongings. Whether you need to store your belongings with us for a week or a year, we will treat your furniture with care. In our climate controlled storage facility, your furniture will be properly padded and protected and your belongings will never share a storage container with another customer. Our friendly and courteous staff members are looking forward to serving you. If you live in the Cincinnati, Ohio or Greater Cincinnati area and are planning a move, call us today and let us take the stress out of moving.